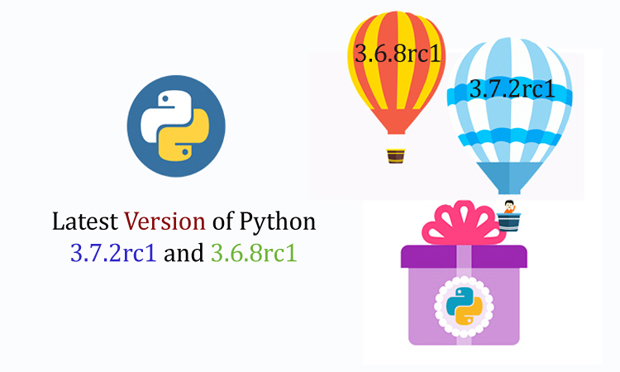 Recently, Python has released its 3.7.2rc1 and 3.6.8rc1 versions. Thus, Python 3.7.2rc1 and 3.6.8rc1 versions are now available for testing. These both versions are an updated version as there are some new additional features that have been provided by the developing team to assist the users in a better way. Basically, Python 3.7.2rc1 is a release preview of second maintenance as the previous version, Python 3.7 was undergoing the second maintenance and therefore, the new and updated version named Python 3.7.2rc1 has been released for the testing. Similarly, the developers have released Python 3.6.8rc1 after its eighth and last maintenance, as it is also a release preview of Python 3.6. There are a huge number of professionals that are using these versions for the purpose of software testing. Hence, the release of updated versions with improved and new features will assist the users in a better and efficient way to perform their task. As the software testing has become an important and essential part of python software development, therefore, the use of these Python versions will provide the users with the opportunities of fixing the bugs in software and to test the new security that is offered by both Python 3.7.2rc1 and 3.6.8rc1. The developers of these versions have also announced that the users should test their projects in every possible manner by using these latest released versions and report any kind of issues to them. Thus, the developers have shown their concern about the feedback from the users as these are the versions that are required to the perfect for the use because any kind of issues in these versions might affect the testing process of a software and also can ultimately cause an effect on the quality of the software that was being tested by using these versions. The core support has been added to assist the user for typing generic and modules. The improvisation in the API has been done as the thread local storage has been added. The addition of the TSS application program interface that is Thread-Specific Storage API has taken over the existing TLS API. The handling of Deprecation Warning has become more advanced. More customization features and customization access has been granted to the user. Now the user can customize subclass creation without using the metaclass. Thus, now the dependency has been removed. This new version allows the user to preserve keyword argument order. The addition of frame evaluation API has made the frame evaluation pluggable at the C level. Some new module has been added to the standard library in order to help the user in managing account authentication, tokens, and many more operations. Therefore, the new versions that are released are expected to become the best tool for the professionals, as they consist of everything that is needed to make the best to use for a user. The upgradations and the modifications that have been done in these versions have resulted in more advanced and an all-around tool for a professional. As the developers have taken a major note of the things that are required by the testers to perform the testing process in a better and much efficient manner. Thus, while releasing these versions developers have added those features and changes that will help the users and will make their tools and software the best user-friendly interface for performing the task of software testing. In this advanced and fast-growing world of technology, everyone wants perfection and high-performance, therefore, it has very important for the software development companies to develop the best quality software and tools that can assist or help the users in a better and efficient way. And for this, the companies have started considering the process of software testing as an important part of software development as this is the process that ensures the quality and performance of the software under various parameters and circumstances. Therefore, now it has become important for the software development companies to develop the software with no lags, errors, and bugs as this will help them to develop the best quality software for the users. And for this, the software is needed to be checked and this checking is done by performing the software testing through the help of various tools and software that have been developed for the purpose of software testing. But the performance and efficiency of the software testing tool or software are also needed to be good enough as it is the software that is responsible for the quality of the software that is being tested. Therefore, the Python developers have released Python 3.7.2rc1 and 3.6.8rc1 for the better software testing experience. Because these are the upgraded and advanced software testing tools that can be used to tackle any kind of issues that are causing any sort of obstacle in the performing of a software. The user-friendly interface also provides great help to the user as this interface makes it simpler and easier to perform the operations and tasks that needed to conduct better software testing. As the features and the various access that are now there in these versions make them more suitable and prominent to be used for the purpose of software testing. The constant efforts and research by the Python developers have made it possible to develop such advancement and improvisations in their previous versions of Python tools and software. As the key features and the changes that are being bought in the latest versions are the one that are made to fulfill the requirement of the time and the need of the users as these are some of the things that are required by the users as they were known to the fact that such changes will allow them to perform their tasks and operations in a much efficient manner as now the limits and restrictions have been removed by the Python developers that were there in the previous versions.